SJ: Before we dive into “Dobro World” can you tell us a bit about your musical background and chronology? GB: As far back as I can remember I was always interested in music, my parents both played in their college orchestras and we always had a piano in the house that I would mess around with. I remember in 2nd grade when the class would have music time I would sing harmony parts, it just came naturally. Oddly enough though, my parents never insisted I have formal music training or piano lessons because they always hated that their own parents forced it on them. I am fortunate to play regularly and record with the talented young Angela Oudean (www.bearfootbluegrass.com). When people ask her mom how she got Angela interested in music she says, “I told her, ‘See those instruments in the corner? Those are mine; you keep your paws off ’em!” I think you’ll put a lot more effort into something when it’s your own idea! When I was 15 a friend gave me a copy of the Kentucky Colonels album “Appalachian Swing” with Leroy Mack, Clarence and Roland White and Billy Ray Latham on banjo. 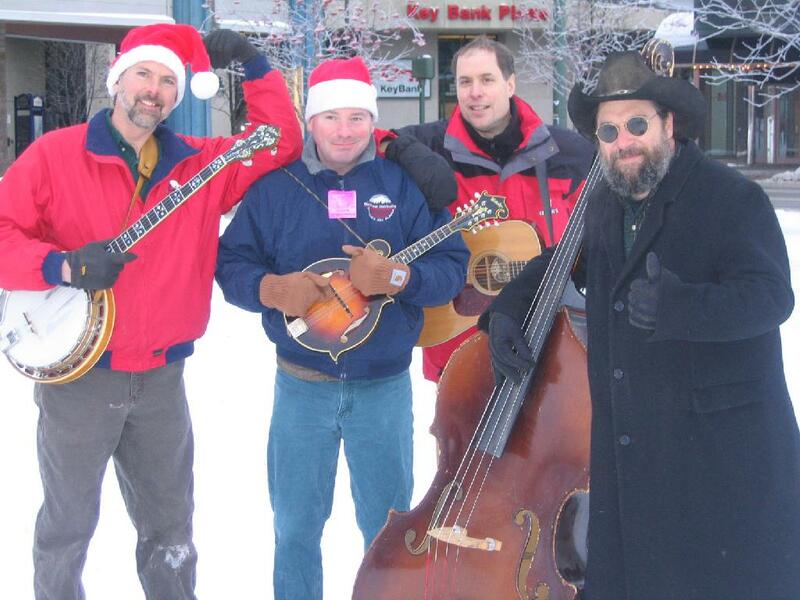 This was the first time I had heard instrumental bluegrass music and I just became driven to learn how to play. I started with the banjo and my mom signed me up for lessons at a nearby music store in Arlington, Va. The banjo teacher turned out to be the great Bill Emerson of Jimmy Martin fame and The Country Gentlemen, etc. I was a fast learner and eager and I think he enjoyed that. Sometimes my half hour would stretch into more than an hour and the waiting room would back up with fidgety kids who would bound out of there, relieved when Bill would say he was running late and to come back next week. He’d tell me, “It’s o.k. ; they only come because their moms make ’em.” Within a couple years I was attending college in Oregon and playing in a popular Northwest band called Puddle City; we recorded an album on 2″ tape and released a 45 rpm single. It was a great experience for a teenager. I picked up the mandolin, bass and some guitar during the 3 yrs. 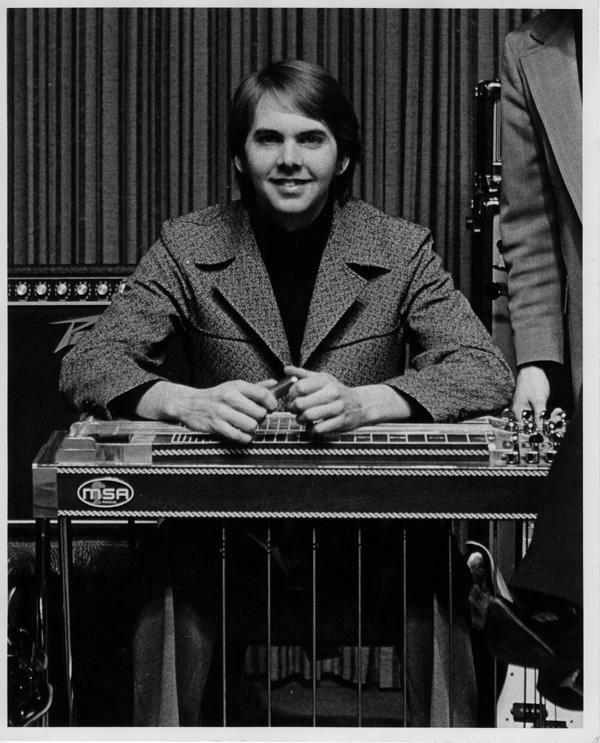 I played with the band, and during my final year in school I became fascinated by the pedal steel guitar. After I graduated I went to work right away in a west coast country rock band doing Flying Burrito Bros, Byrds, New Riders etc. type music. My future wife and I decided to take a road trip to Alaska (I had lived there before, age 8-11) and found a thriving music scene in Anchorage, clubs flush with oil pipeline money and live music 7 nights a week. That was 32 yrs. ago and I made a living with the steel guitar for most of it. Eventually the live music scene declined along with my desire to keep pursuing it. My steel spent more and more time in its case, sometimes more than a year. I credit my son Dan (who I never pressured to play) with his talent and passion for music for getting me active again and the dobro for giving me a new passion to pursue. SJ: Can you help me demystify some of the commonly held notions about pedal steel vs. dobro? It seems that John Q. Public assumes that if you play the one you automatically can play the other. I don’t know how accurate this is, but I’ve heard that pedal steel players tend to be very meticulous because playing the instrument is like driving a fancy sports car with multiple gear levers! I’ve also heard that pedal steel players tend to have a lot of theoretical knowledge but not all can adapt to the more physical demands of playing the dobro. GB: Picking up the dobro was really frustrating for me for quite awhile, it felt like I had both hands tied! The tuning and the pedals and the knee levers on my steel all make everything available in pockets within a few frets. I can play a 3 voice harmonized scale that contains major, minor and dominant 7th triads all in the space of 2 frets! On dobro your options are limited and you have to chase all over the neck to find the notes. 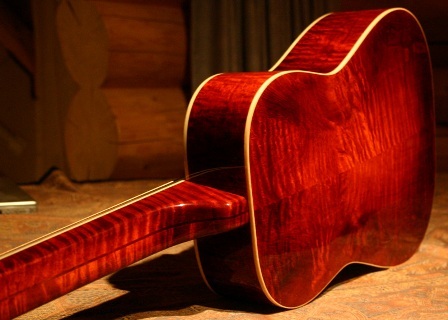 Many chords are just plain not possible so you do what you can by playing fewer notes. 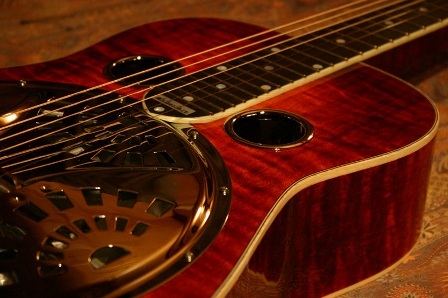 The bar used by steel players is round with a bullet nose and heavy compared to dobro bars. Rarely do you ever pick it up or do any hammers or pull-offs or use open strings on psg. I was tempted to just use the bullet bar I was comfortable with but have you ever tried to do a pull-off with one? Forget it! I realized if I wanted to try to play bluegrass like Jerry and Rob I had to use the same tools. So the left hand technique is radically different. The right hand is just as different! My steel has 12 strings per neck and the spacing is almost twice as close. On steel you need a really light touch, and the sustain lasts essentially forever. To get decent tone out of a dobro you have to pick 2-3 times as hard. The high strings on steel are .010, and .013, compared to .017 and .019 on dobro so the feel is way different. With the sustain on steel guitar in order to play cleanly without a bunch of notes overrunning everything you have to do some form of blocking. Same is true for dobro, but even more critical on steel. I call it note control. While players like Rob Ickes do this mainly with the left hand, steel players do it solely with the right hand by palm blocking or pick blocking. So you ask how does playing steel help with learning dobro? One big part is playing in tune, the ear-hand coordination you develop playing with the bar. I would say the biggest advantage is mental. Steel guitar playing teaches you a lot about the nuts and bolts of making music and trains your ear to hear and recognize notes and intervals. Is dobro more physically demanding? I would say no, just different. Playing steel means coordinating your hands, feet and both knees without thinking about them. The right hand touch is critical on steel. Not to mention the physical demands of packing up a 90 lb guitar and a 90 lb amp before and after the gig! That’s reason enough right there to switch! I think playing banjo helped me a lot because the dobro G tuning is much closer to the banjo and some of the rolls and melodic runs from banjo go right over to the dobro. Sometimes I tell people if you put a banjo and a steel in a blender it’s like playing dobro. SJ: I’ve never thought of it that way, but that makes perfect sense! Can you elaborate a little more how playing psg is demanding in terms of ear training and other aspects related to music theory? How has your experience in playing psg affected your approach to arranging melodies, for example? Does it give you a different toolbox to work with than if you had grown up listening to and playing the dobro exclusively? GB: I came to the pedal steel from the banjo where I was more or less stuck thinking out of the key of G. To play in different keys usually meant just put on a capo but you’re still thinking in G! The steel liberated me from that trap, plus the chord progressions of different styles of music forced me to get a grasp of chord construction and what makes a chord sound the way it does. I’m no monster theory guy but I know enough to figure out most things eventually, “The Christmas Song” for example. On the psg you can navigate through a chord progression a lot of different ways, press a pedal or two, move up two frets, engage a knee lever, move back a fret, that kind of thing. I rarely use open strings so all the moves work in any key. If the girl singer (is it P.C. to call her that anymore?) wants to sing “Crazy” in A flat, F sharp or Z double flat? No problem! The bar is like a big capo. I eventually stopped thinking in keys and chord names and only think in the number system, you know, 1,2m,3m,4,5,6m etc. But I think anyone who plays professionally in a variety of musical styles gets a handle on this stuff. The pedal steel just allows you see and hear certain aspects of music instantly; for example, if you engage the lever that lowers the root notes a half step, (in a G chord, the G notes) voila! You have a 3m chord! (Bm). Or if you engage the lever that raises them instead, you have most of a diminished chord that inverts every three frets up and down the neck. You discover other interesting stuff like substituting chords, e.g. if you play a 3m triad over the 1 you have a nice lush major 7th sound. So I think if I had gone to the dobro from the banjo I’d probably still be thinking in G all the time. Having the steel was always handy for figuring out 3 part harmonies and helped train my ear for that job. Three singers are basically just singing a chord, and since the psg can play just about any major or minor chord, 6th , 7th , 9th etc, I can show somebody the part they keep messing up! Plus there’s just a fair amount of licks and ideas that you accumulate just from playing a long time, good ones and bad! The licks usually don’t work on the dobro but sometimes you can adapt the ideas. SJ: Over the years, I have come to appreciate how even a basic knowledge of music theory — if nothing else, the number system – can really help you to think on your feet! It’s embarrassing, but I can remember doing coffee house gigs “way back” in the early 90’s playing M3rd’s in a tune built around a I-VII chord change and wondering why it didn’t sound good! (laughs). One of the aspects of your dobro playing that I admire is that your arrangements and ideas seem to be coming from somewhere other than “dobro-land” i.e. the influence of contemporary players. What process do you go through when you come up with an arrangement of a given tune? For example, how did you come up with your arrangement of The Christmas Song? GB: What? You mean I don’t sound like Rob Ickes? (laughs) I tried and tried to learn to play Monrobro, at the RockyGrass academy, I even had him show it to me note for note on video! I can play it sort of, but it sounds like someone doing a bad imitation! Nobody can do Rob Ickes as well as he can. Sometime during all those years playing steel in bands I stopped copying and just played the thing. At least half of the stuff I had to play didn’t have steel parts on the records anyway so I was on my own. Of course I’d trade my playing for Jerry’s or Rob’s if I could, but I’m stuck with mine so I just play and make the best of it. The Alaska Mando cd was a real challenge to come up with solos for because I’m really still learning how to play dobro! I’m not usually at a loss for ideas though, so I would just work up licks and phrases until I had a part. And the good thing is that when I play them, I’m using the licks and phrasing that comes naturally to me. I can do a much better job at imitating myself! When I decided to figure out The Christmas Song, first I got the chord chart off the internet; then I went to the iTunes music store and listened to a bunch of clips to find one that resembled what I had in mind. I paid the 99 cents and downloaded a version from “Christmas Jazz” that was saxophone with piano, drums and bass. I was kind of familiar with the song already, just needed something to check back to. Around that time I had started playing around with the low G tuned down to E and I found it was perfect for playing all those minor 7th chords on the chart. I wanted to play it with all the interesting chords in it, at least to the extent I could on the dobro. It took me a few days to work it out and I was really possessed by it! I’d wake up at 4 or 5 in the morning with the song on my mind. I have no doubt it’s not perfect and some jazz guy will find fault with it, but some of the clips I heard were pretty out to lunch so this is just my interpretation. My Panhandle Rag version came one day when I was just noodling and just started playing it from memory of some old vinyl steel guitar album, not even sure which one. I tried different keys and I stumbled on the D6th chord at the 7th fret by leaving the top 2 strings open. I liked the sound so I put it together around that, putting in swing steel sounds. I have a new solo worked up that’s going on my solo cd that’s pretty cool; it has a lick that goes up to the 24th fret. Unfortunately my guitar only has 19, so I had to put a piece of tape up there as a reference. Anyway, I hope that answers your question. I spend most of my dobro effort figuring out ways to play rather than copying stuff. I hope that doesn’t sound cocky because there’re lots of great players who can show me a lot, you included Rob! 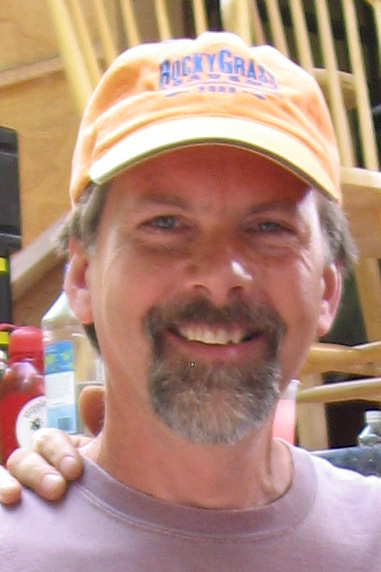 I’m doing the RockyGrass academy with Rob Ickes again this summer. That whole RG experience is so awesome. About 20 of us set up a big Alaska camp on the river and host an Alaskan salmon barbeque that spawns (har) some great celebrity jams. I would be remiss if I didn’t give the credit to fellow Alaskans, Dave and Patty Hamre for this. I waited until the last minute but I signed up for the ResoSummit in Nashville as well. 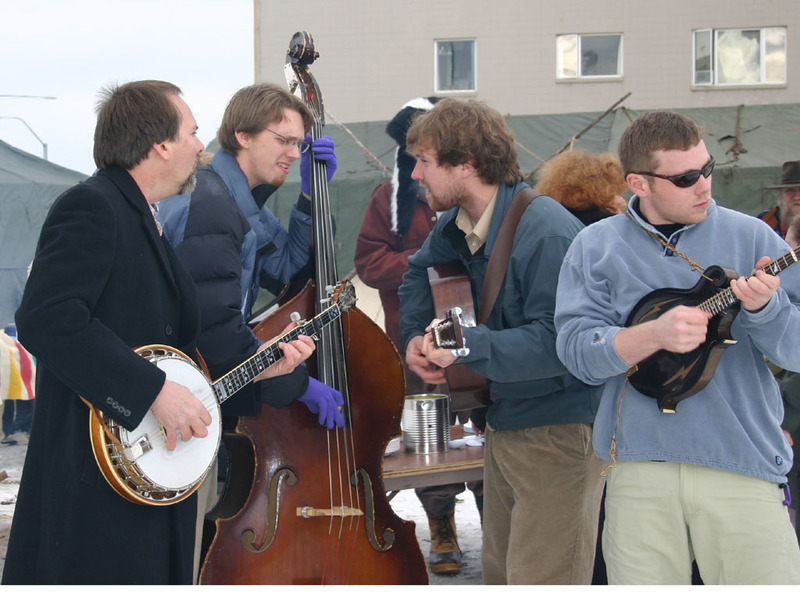 SJ: The Alaska Mando c.d. gets my vote for instrumental record of the year! The title may be Alaska Mando, but it strikes me as an ensemble approach, rather than your typical “mando c.d.” with the other instruments playing more of a background role. Additionally, the songwriting is first rate and the overall musicianship and interplay between the band members is absolutely amazing! In some ways listening to this c.d. introduced me to the bluegrass side of your playing. It sounds like you are playing more “single-string-modern-bluegrass-dobro” stuff – lots of hammer-ons and pull-offs, but once again your ideas/arrangements are really cool and seem to avoid any typical dobro clichés. Can you expand a bit on how you approached some of the faster tempo tunes on the c.d.? Does your background playing banjo come into play from a right hand perspective in the more up-tempo bluegrassy numbers? GB: I’m proud to have been a part of the AK Mando cd and happy that Joe Page wanted my dobro to play a substantial role in the music. We have played in several bands together during the last 15 yrs, but this was my first experience with his original music. I think it’s great and I enjoyed taking it for a spin on the dobro. On the fast material I certainly did use banjo rolls and runs where possible. At the end of my break on “Behind the Curve”, the12th track, there are 2 measures (4 beats) of 16th notes straight from the banjo. Most of the bluegrassy stuff is probably more typical single string dobro technique with a lot of pull-offs! I think mostly I just did the best I could to keep up! The fastest tempo is only about 136 bpm so it’s not like Ronny McCoury playing Rawhide or something that’s just insane. In some ways even if the actual technique is a little different I think it helps that I like to play fast and am pretty comfortable playing banjo fast. I feel a little self conscious talking about my technique since I’ve only been playing dobro about 20 months now and my technique is still developing along with my repertoire. SJ: Let’s switch gears and talk about guitars and performance/live sound equipment for a moment: What instruments do you play; what does your live rig consist of? Do you have any comments about gear in general? GB: I’ll list my non-reso stuff first, I play an autographed Gibson Earl Scruggs model banjo, an MSA double 12 psg with 8 pedals and 4 knee levers through a Peavey Session 500 amp. I play a Wechter Scheerhorn Elite model 9520 dobro, flamed maple, into a Shure KSM-32 microphone. This guitar has always sounded very good to me since I got in 12/05. All the clips I have posted on ResoNation were recorded with it as is. Last October I had Tim Scheerhorn do some work on the setup and he discovered the cone had collapsed. He put in a new Quarterman and did his setup magic and made it sound the best ever. First let me say that I don’t think there is a best resonator guitar for everyone. The same guitar can sound totally different for different players. In choosing an instrument it’s essential to try them out yourself and find the one that sounds the best with your hands and style. Since I started playing dobro in 7/05 I’ve been trying every make of guitar I could get my hands on. I decided to go to IBMA week in Nashville last fall for the first time to do all the usual fun festival stuff, but mainly to try out as many different guitars as I could and place an order. Looking back and counting I recall playing at least 22 different top notch instruments by at least 7 builders. The verdict? For me, with my hands, without exception the 9 Scheerhorns I tried had the sound, responsiveness and power I’m looking for. Some guitars seem to hit a plateau with their output, with the Scheerhorn you can dig in and there always seems to be more! Plus I just love the tone, deep bass and crystalline highs. I get this visual imagery of looking into a deep pool of crystal clear water. I got to hang out with Tim some at IBMA and later out at his shop and watched while he worked on my guitar. Something that I think is special is that this is a one man show. Tim’s hands are the ones doing it all, and when he quits that’s the end of it. I think making instruments at this level is an art form like playing music. Two different musicians can play the same song note for note but it doesn’t sound the same. Other builders have copied the Scheerhorn but they don’t sound exactly alike. I hope you guys that love your non-Scheerhorn guitars forgive me for getting carried away, but Rob asked me to talk a little about how I ended up on Tim’s waiting list. There are other beautiful resos I would love to own, Harper, Meredith, Beard, Clinesmith etc. and I hope someday I can. SJ: Have your motivations and/or reasons for playing music changed or evolved over the years? Do you have any closing comments about the role of music in your life and/or music in general? GB: Yes, some things have changed. The intrinsic enjoyment of playing music is still the same, the excitement and pleasure of having the sounds and rhythms come together is really fun and compelling. There was a period of time when I lost some of that, though. I made a living playing in house bands for 20+ years; I figure I played at least 4,000 nights. In the early years the pride and satisfaction of playing well and the magical moments that sometimes happen on the bandstand was enough to outweigh the drawbacks. Eventually the routine of playing dance music in smoky clubs for patrons burned me out and it wasn’t fun anymore, it was a job with politics and headaches just like any other job. I continued playing much too long with a dead battery. After I found a different career I found myself having a lot more fun with music. Now that my kids are playing, their energy and enthusiasm is contagious and I’ve experienced kind of a rebirth in my own musical energy. I find myself practicing the dobro for hours at a time daily, whereas before I went for years without practicing my instrument. I guess when you play that much you don’t really want to touch it in your free time. Nowadays I’m having a great time learning this new instrument and figuring out my style on it. I’ve really enjoyed the recording I’ve been able to do and I intend to keep working on sounding better and learning how to make better recordings. What may come of it I don’t know, but just having some new goals and avenues for my music is rejuvenating and exciting. About music in general, there is so much you can say. There’s a non-verbal communication that happens in music that you can’t really explain to somebody who doesn’t play. It’s a way to connect with people that you may or may not have much in common with. It’s a way to both give and gain respect regardless of who you are or whatever else you may have accomplished. Just today I got an email from a former banjo student I had over 30 yrs. ago who found my Myspace page. He just wanted me to know how my teaching way back then inspired and helped him persevere, and that the banjo and playing music has played a central role in his life. How cool is that? Well, I don’t have to explain that to you, Rob. Your teaching and this website is helping so many players to learn and to make playing music a rewarding part of their lives. I’m really flattered to be one of your featured artists. I’ve been playing with the drop E tuning for about 8 years now. dobro on an album named Alaska Mando by my Alaskan friend Joe Page. root of the relative minor chord on the bottom string when I want it. root. Those are two ways of arriving at the same 5th fret Am. are The Christmas Song and Greensleeves. full E7 chord to strum before going back to A.
dobro can make with it. 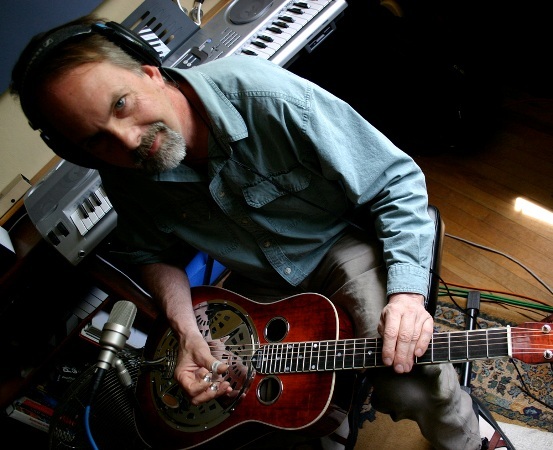 Greg Booth lives in Anchorage, where, for many years, he’s played pedal steel guitar in country groups as well as banjo (which he first learned from Bill Emerson) and, more recently, dobro. Winner of the RockyGrass dobro competition in 2006 (after playing that instrument for only one year), regular faculty and participant in ResoSummit, and star of YouTube, Greg’s 30 some dobro videos average 1800 plays daily and are approaching 2 million views lifetime. “Greg’s innovative, expressive dobro playing is even more remarkable” says guitarist Joe Karson, “when you consider that he employs no ‘licks.’” Greg plays dobro and banjo with the Kathy Kallick Band, appears on four of Kathy’s albums and is soon to finish another KKB album this year.